If you have a large restaurant with many sit-in tables with a wide menu spread, it is but obvious that you would be requiring multi-screen digital menu boards. 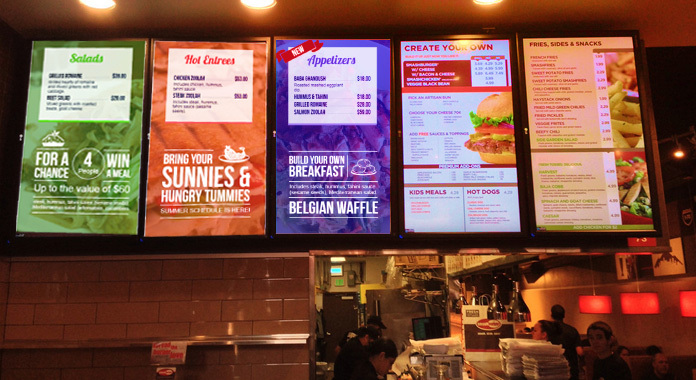 Major restaurant chains such as KFC, McDonalds and others have already installed the same many years ago, and these menu boards are exquisitely integrated into the interior designs of the restaurants and operations. And while one can place multiple screens at any time, a little thought on its aesthetics and benefits can go along way in brand building and enticing the target audience..
Let's first elucidate the technical side of things. Step 1 for you is to design your menu in Power Point since it is easy to use and update. Place one menu per screen and give them names such as sandwiches pptx, burgers pptx, desserts pptx and so on. Step 2 for you is to connect your menu to your menu price list data base. To make updating simpler you can place names, prices and pictures of your menu items on one spreadsheet which can be connected to the screen by DataPoint. Step 3 involves managing and displaying the data on the digital screens. If you have a single location you can use Dynamic wall software, and if have multi-location restaurants you can use iPoint. ipoint is a digital signage player which helps connect specific menu data on specific monitor screens. iPoint can display other graphic or advertising videos as well, as per your choice, which you can share with your customers. Good for aestheticsand easy on the eye-sight. After all, its all about getting the customer's attention for boosting sales. For instance, if three screens with a single white color theme is designed chances are good that the customer after walking in will feel comfortable looking at the multiple screens and deciding on his order. The easier the customer can connect with the screens, the faster he will choose and order. And a restaurant wants business. Quickly. A multi-color theme with graphics can often confuse the customer. The digital signage player connects screen data with data on stocks as well. Hence, if stocks on burgers, which is listed on screen 2 is depleted, the restaurateur can immediately update the menu with a fresh list of items, while screen 1 and 3 are kept running. Multiple screens are easy to install and are also the most cost-effective form of advertising. You may run videos of your special items and up-sells at a particular real time to boost your sales. Single themes are a good aid to branding. The restaurateur can give specific names to items or design a corporate logo and place it strategically on all three screens. Videos on branding of the retaurant can also be played to customers. Given cloud based benefits, the restaurateur can update menu content anytime and from anywhere. This goes for multiple screens as well. Infact, multiple screens will facilitate upsells quicker as customers will be offered specific items at specific times. A FDA compliant menu with a large spread can best be displayed through multiple digital screens. Multiple screens can facilitate more space for content to gain the customer's trust. Better customer engagement can be fostered by multiple screens with a single common theme. To make the customer experience visual along with the gastronomic pleasures, restaurants go out of their way to make the experience luxuriant.